Introductions and Welcome: Linda Hedges, co-Chair, led the meeting. Linda let everyone know that Mary Weaver has been ill but is improving a lot and hopes to be able to return to our meetings soon. Introductions around the room were made. Present: Mayor Ferguson (as a volunteer supporting NCSD), Councilor Hedges, NCSD Asst. Supt. Ron Stewart, NCSD Facilities Durelle Singleton, Chief Bob Jordan, City Staff Liaison Pat DuVal, Co-Chair Linda Hedges, Parks Coordinator Sarah Smith, guest Greg Bowman and 6 neighbors. Milwaukie Police Update: Chief Jordan distributed the monthly property crime stats. Our neighborhood continues to have very little crime; most criminal activity is opportunistic where people leave items of value in their vehicles. The Department swore in two new officers today: Clare Burnham and Jeff Rogerson. They will be undergoing about 14 months of training before they are on their own, but this now makes the department up to full operational strength. The photo radar van is back in service! 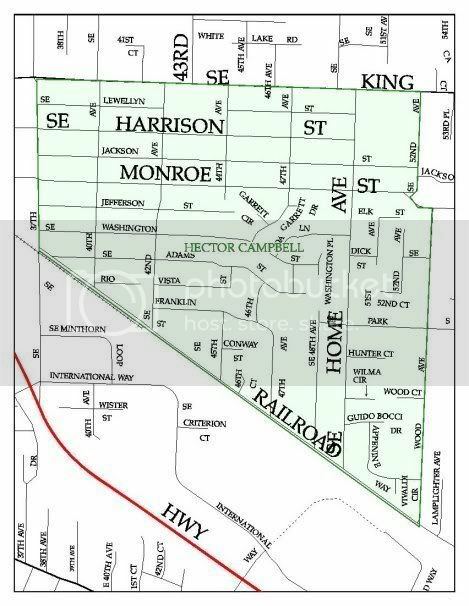 The Council approved at its last meeting an ordinance that will clear the way for positioning the van in specific safety zones, such as 99E and Hwy 224. It has been fitted with new digital equipment which will produce much clearer photos of drivers and will allow fewer dismissals of citations due to unclear photos. A Milwaukie High School student and staff will assist in preparing a video for education about the van, its purpose and how it works. The video will be available on the city’s website and will be referenced on each citation. A second video will be made to appeal to teen drivers at both MHS and Putnam. a) Minutes from the previous meeting were approved by consensus. Motion made by Darlene Albertson; seconded by Sarah Smith. It was reported that about $1200. There are no outstanding grants. We anticipate $5,000 being contributed to the Home Avenue pathway project. There will remain a healthy balance for other projects we may wish to undertake.The WSMP project (Home Avenue path from Wilma Circle up the east side of Home to Hunter Court) will begin this week and should be finished by the end of November. c) City Liaison Pat DuVal reported that the 5th Poetry Series is underway. Three new pieces of sculpture have been placed in The Sculpture Garden next to City Hall, under the theme of “Dazzle Me with Color”. The city’s free leaf drop dates at the Johnson Creek Facility are Nov 5, 19, Dec 3,10,17th. There is a Housing Design Open House on Thursday, Oct. 20th 6-8pm at Milwaukie Christian Church. This Open House highlights proposed design standards for single family homes and multi-family dwellings for future building. More city events can always be located at the city’s website. The Mayor’s State of the City address will be held at the Odd Fellows at noon on Tuesday the 11th. d) Light Rail report –This month’s meeting will be held jointly with the Design and Landmarks committee meeting relating to the Kellogg Creek LR Bridge 6:30pm City Hall Chambers October 17th. e) Parks Report: Sarah Smith reported that discussions regarding a community garden located at the northeast side of the Campbell School site continue; at this point the garden proposal has neither been approved nor disapproved by the district. She introduced Durelle Singleton from NCSD who reported on how the district would be able to work with a community group operating the garden. If the garden is built, there will be plots to rent, with water available. The fees have to be sufficient to pay for water and insurance and other amenities. When our proposal is accepted by the district, a garden planning committee will be formed. Sarah also distributed a list of dates for Homewood Park work parties: 9 to noon Saturdays Oct. 29, Nov 19, Jan 14 and Feb 11th. Contact Sarah@thegardensmith.com or 503-653-0015 if you have questions or want to volunteer to help. SARAH NEEDS HELP WORKING ON THIS BEAUTIFUL PARK SO MANY NEIGHBORS AND PEOPLE FROM ALL OVER THE CITY ENJOY– PLEASE IF YOU CAN, JOIN A WORK PARTY! g) Boards and Commissions report :No reports were made. h) Councilors Report: Councilor Hedges reported that a feasibility study has been approved by Council into the multi-use stadium. The City manager has been authorized to sign three contracts for $297,000 for a 12 month feasibility study. The first 3 months phase is valued at $84,000 and the contracts can be cancelled if the council or citizens feel that there is insufficient support or the project is not financially feasible. Public Comment: Kathy Heintz, the homeowner of the house on the corner of Wilma Circle and Home Avenue, spoke regarding an issue raised in connection with the Home Avenue path. Code Compliance had received a complaint that her fence encroached into the right-of-way and is located right up against the sidewalk.. The fence has been in that location since the house was built in the early 1990’s and this had not been raised by city staff either at the time she purchased the house several years ago. The citation by Code Compliance requiring her to move the fence back onto her own property line was going to be costly and very difficult for her due to how her backyard and irrigation system are laid out. She had spoken with a number of neighbors and no one that she spoke with objected to the fence being located right next to the sidewalk.. She felt it was unfair she was being required to move the fence after all this time and that it didn’t appear to her to affect anyone using the sidewalk. This issue has been referred to code Compliance and the city manager. Councilor Hedges stated he hoped she would be able to work out a reasonable solution to the issue. Mayor Ferguson said if she cannot agree a solution with the City Manager she can appeal the decision to the Council. Note: Once the new pathway is in place, it will join up with the short sidewalk referred to above, and all walkers, parents with strollers, and those with walking frames or wheelchairs will then be able to use the entire length of pathway. That is not currently possible as the current sidewalk ends in tall grass and a fire hydrant. Coyotes Seen on Washington Street: A neighbor came to our meeting with a serious concern about coyotes observed in our neighborhood. Thanks to our concerned neighbor, more of us will be aware of the problem; if anyone else has concerns about issues facing our neighborhood, you are encouraged to come to a meeting or send us an email! Please share the information with your neighbors, and take precautions to protect your pets, especially cats and small dogs. 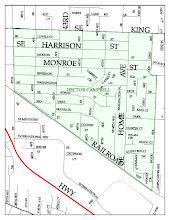 More information on urban coyotes is available on the Hector Campbell website at http://www.hectorcampbellnda.org/2011/10/coyotes-spotted-in-our-neighborhood. Tool Library Proposal – Greg Bartz Bowman, representing a group interested in setting up a Milwaukie Tool Library, spoke about their hope to begin a tool lending library where donated or purchased tools can be used free. 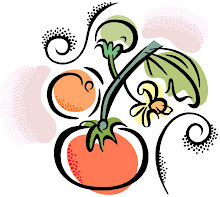 Tools include landscaping, home repair, gardening, painting bike and auto tools – even seeds. The program will be supported by grants and donations.. There will be a meeting on Thursday, November 17th at 6:30pm at the PSB, 3200 SE Harrison, to discuss forming a steering committee. North Clackamas School District Operations Levy: Mayor Ferguson, acting as a parent and volunteer for NCSD, conducted a presentation outlining the reasons for and how money would be spent if the District puts an operations levy on the November ballot. He polled those present on how much money they felt the District could reasonably ask for, what priorities people felt any money raised by it should be spent on, the possible costs per $1,000 assessed value of a house, and what those present felt about drawbacks or reasons why the levy might not pass. Those interested in knowing more about the “Local Option Levy” can contact Joe Krumm at krumm@nclack.k12.or.us. Or going to www.nclack.k12.or.us/localoption . There was no further business. The meeting adjourned at 8:30pm.